Special Containment Procedures: SCP-300 is stored in a locked and climate-controlled container at Site ██. Experimentation on SCP-300 may only be performed with prior written permission from at least one (1) Level 3 Senior Researcher, and any observations made must be recorded for later analysis. 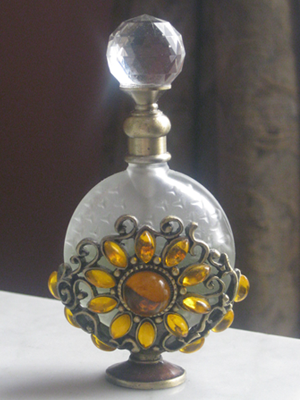 Description: SCP-300 consists of an antique glass perfume bottle (SCP-300-1) containing approximately 2.4 cc of an unidentified colorless liquid (SCP-300-2). When a single drop of SCP-300-2 is extracted from SCP-300-1 and the drop is viewed through a standard optical microscope, an animated scene becomes visible. While no two drops have shown precisely the same scene, these scenes generally take the form of pastoral or woodland scenes consistent with that of Victorian-Era England. So far, attempts to analyze the exact chemical components of SCP-300-2 have inexplicably failed, with spectrometers reporting wildly variant or false data, thus making attempts at replicating it impossible. SCP-300-2 also invariably evaporates within 2-8 hours of being drawn outside of SCP-300-1, despite all attempts at stabilizing the substance or controlling laboratory conditions. SCP-300 was first documented along with [REDACTED] after being recovered from the attic of a row home in [REDACTED], UK on ██/█/1863 following a raid by agents of the Royal Society for the Security, Containment, and Protection of Anomalous Artefacts. SCP-300 was transferred to SCP Foundation possession on █/██/19██. Procedure: A single drop (approximately 0.07 cc) of SCP-300-2 transferred to microscope slide. Video recorded for approximately 3 hours before SCP-300-2 evaporated harmlessly. Details: Visible scene consists of a dirt road lined with trees of an unidentified species. Coloration of leaves suggested that the scene was taking place in autumn. A light breeze is blowing, causing some of the yellowed leaves to fall to the ground. At approximately 1:07:18, a horse-drawn carriage with a driver and two passengers passes through the scene. Clothing worn by the individuals seem to be consistent with that worn in Victorian-Era England. No other significant events are recorded. Procedure: A single drop (approximately 0.08 cc) of SCP-300-2 transferred to microscope slide. Video record lasts approximately 5 hours. Details: Visible scene consists of a rural farm. Size of wheat plants visible in scene indicate late summer time period. A family consisting of two adults and three children of varying age are periodically visible in various areas of the farm, performing chores. Clothing of family consistent with previously established time period. Procedure: A single drop (approximately 0.07 cc) of SCP-300-2 transferred to microscope slide. Video record lasts approximately 2 hours. Details: Visible scene consists of the interior of a well-furnished residence. Within the visible area are a lit fireplace and several armchairs. Three well-dressed individuals, two men and one woman, are seen conversing while enjoying a bottle of what is presumably red wine. Lip-reading analysis of their conversation is incomplete, but fragments developed so far indicate a casual political discussion regarding issues appropriate for the year 18██, again in Victorian England. Procedure: Two drops (approximately 0.15 cc) of SCP-300-2 transferred to microscope slide for experimentation. Video record lasts approximately 3 hours. Details: Video record is blurry and indecipherable. Although a few fragments of video have been analyzed, no useful information is gathered. Further experimentation is to be limited to a single drop of SCP-300-2. On ██/█/19██, Dr. █████ was found dead in Laboratory C, with cause of death being self-inflicted gunshot wound to the head. Laboratory video surveillance showed Dr. █████ obsessively viewing a recent recording from a SCP-300 experiment and becoming increasingly agitated until he pulled out his sidearm and took his own life. Upon investigation, the recording was identified and analyzed as a 3-hour long recording made during an experiment on ██/█/19██. The recording shows a young woman of approximately ██ years of age, sitting in an armchair and embroidering an article of clothing while singing to herself. Further investigation showed a startling resemblance between the woman and Dr. █████'s late wife, who died during [REDACTED], up to and including a birthmark visible on the left side of her neck. Experimentation on SCP-300 has been temporarily placed on hold pending research into possible telepathic or memory-affecting capabilities.